The Izu Peninsula is covered in mountains and valleys reaching out to the ocean. On some of these steep slopes farmers are still tending their terraced paddies, or tanada in Japanese. Here are some pictures of the beautiful tanada in Matsuzaki, the west coast of Izu. 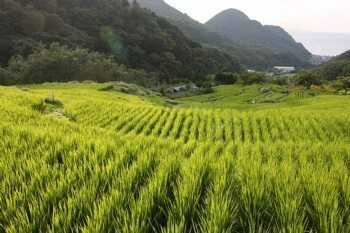 Looking foward to harvest time, when the rice will be cut and hung to dry.